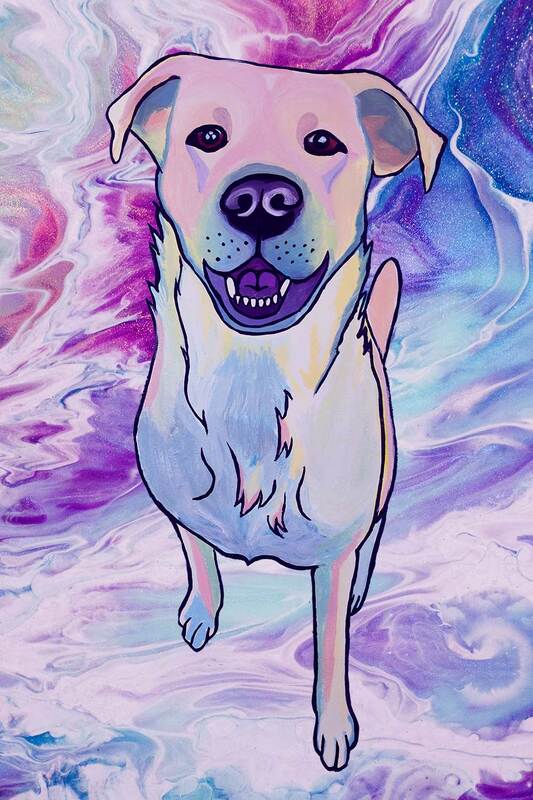 Adding flow, color and movement to the original Dog Art by Mia portraits! on canvas in various sizes! unique works of art that will make you smile. So here is the process from start to finish. I create the fluid abstract background paintings by mixing acrylic paint colors with different kinds of pouring mediums, and pouring the paint in various ways onto a canvas or substrate. Once we agree on which background you'd like to use and what size finished piece, we'll discuss the color scheme for the whole painting. Then, you send me a photo of your dog, and I'll put all the pieces together! My fluid dog portraits are UV resistant and acid-free, painted with high quality acrylics on Epson Exhibition Matte Canvas. For pricing, please see the chart below the dogs. Taxes and shipping/handling are not included, and will be estimated based on the dimensions and your location. Do you want to fancify your majestic creature atop a beautiful, flowing and colorful backdrop, created by yours truly? As with my original portraits, after filling out the form in the previous button, I will reach out to you to discuss your painting's timeframe and obtain a photograph from you of your dog. This step is muy importanté!!! The content and quality of your photo will determine how well I can capture your dog's personality in the finished painting. If you live in/around Austin, TX, I am a photographer, too, and a photo shoot can be arranged with me! When your photo has been approved, I will send you an invoice. I work on commissions in the order of payments received, so when I see yours, I will let you know an ETA, and will keep in touch with you along the way!